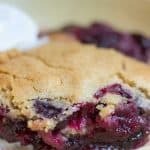 Blueberry cobbler that's not too sweet, and with a real depth of flavor. Thoroughly rinse blueberries and remove any small stems. Then add blueberries to 13x9 casserole dish, along with 2 mini bottles of Grand Marnier (about 1/3 cup), and mix well. Add 1/2 teaspoon cinnamon and 1/2 cup sugar and mix again. Set aside and preheat oven to 375 degrees. In a medium bowl - add butter and 1 cup of sugar. Cream together until light and fluffy. Add eggs and vanilla and mix until fully combined. In a small bowl, thoroughly mix flour, baking powder, and salt. Gradually add flour mixture to butter mixture, stirring just until ingredients are combined. Spread batter over blueberries, trying to cover as much of the surface as possible. Bake uncovered for about 40 minutes, until topping is golden and filling is bubbling. We recommend placing a baking tray underneath, just in case filling bubbles over the edges.